Join the free & best Saini matrimony site. Helping young men and women from Saini Community find their life partners. Brother-in-Law: B.E. & MBA, working in Govt. / PSU Company. We are a simple, educated family with strong cultural background. .
My daughter is beautiful, charming, jovial and cheerful person who is hardworking and self-confident. She is pleasant and gentle in nature. 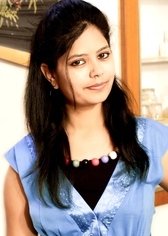 She is a down to earth girl with a blend of traditional & moral values. She likes Reading, Dancing, gardening, Cooking, listening to music & watching movies. She believes in sincerity and respects others values & feelings. She is hard working, believes in good efforts which can lead to a prosperous life. She is an adaptable to conditions, strongly believes in God & truthful living. She is well balanced in her thinking with matured understanding. Saini Yog is a Free Saini Matrimonial site, made for the welfare of the community. The objective of the site is to provide top quality matrimony service to the young men and women of Saini Community, in finding their life partner. We do not charge any kind of fees or money for viewing profiles, or for successful matches.